A wide offer of handling equipment, subgrades, steel structures as well as power supply and control systems manufactured by renowned companies. Rialex Crane Systems specialists provide services related to crane technology and covering design, construction and installation of handling equipment. Our back-end services remain at your disposal as well. We will listen to your expectations and help you select handling equipment. We will suggest optimal structural solutions and the appropriate means of modernisation of the equipment possessed. 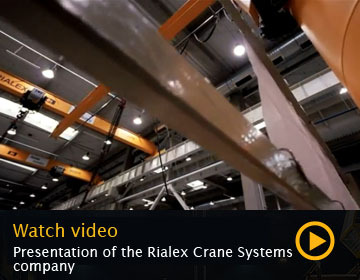 Design, production, delivery, installation and maintenance – you know best how important it is that each and every one of these stages be executed by a reliable and experienced contractor and solid partner, such as Rialex Crane Systems. Our specialists will design and deliver high quality equipment customised to your needs, while offering technical support and providing back-end services. Thanks to these comprehensive services, your company will be provided with new development opportunities.